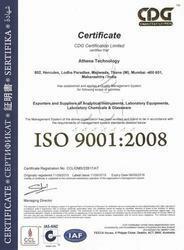 Established in the year 2010, Athena Technology, an ISO 9001: 2008 Certified Company is a reputed manufacturer, exporter and trader of high quality scientific instruments and laboratory equipments. Our unparalleled array of products includes Nitrogen Evaporator, Nitrogen Gas Generator and Hydrogen Gas Generator. Under the brand name Athena, our products are known for their high efficiency, unmatched reliability, high durability, proven performance. Our instruments finds application in Research Labs, Colleges, Schools and various industries like Life sciences, Chemical, Petrochemical, Semiconductor, Pharmaceutical and Environmental. Moreover, we export our products to European Countries, Middle East, South East Asia, Africa and USA. In the future we hope to keep on contribution towards building a more affluent human society by providing the customers with innovation products, best quality and perfect Installation Services. The infrastructure that we have set up for manufacturing our products is highly advanced and well equipped with modern technologies. The unit is segregated with several in-house departments like production, quality control, sales & marketing. All the high-tech machinery in our unit is handled by a team of skilled professionals. Their rich domain expertise and ability enable us to complete the exact requirements of our prestigious clients within the set time limit. Quality is of immense importance to our organization and hence, we ensure to develop our range of machinery as per the International Standards and Quality Norms. As per this policy, we use best quality raw material and innovative machines in the fabrication process approved by our quality experts. Under the able and efficient guidance of our mentor Mr. Milan Salunke, we have carved a niche for ourselves and have become one of the leading companies in the industry. His years of experience and strong business acumen have helped us in garnering a strong presence in the market. Our belief is ‘To be credible in the market, we must be truthful’ So we work with utmost sincerity and truthfulness. Our goal is to satisfy our client base with our products. The organization has witnessed tremendous growth in the recent years, mainly due to the contribution and hard work of its workforce. We have a team of expert professionals which has years of experience in the industry. These professionals use their expertise and innovative approach to manufacture the best range of scientific instruments and laboratory equipments. We have strategically categorized our team according to the different work processes. Quality has always been one of the major concerns in our company since inception. 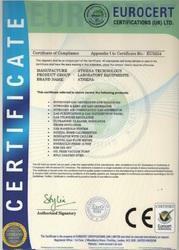 We offer our range of products as per the ISO 9001:2008 standards. In addition, our products are manufactured as per industry set standards. Our team of procuring agents ensures that the raw material is procured from reliable vendors. Our in-house quality inspection department strictly tests & monitors the entire range at every level. We are facilitated with a sophisticated research and development wing backed by a diligent team of R & D experts. All their endeavors are directed towards development of products that are in conformation with ISO 9001:2008 standards. In order to provide quality range of products we undertake extensive research activities so as to cater to the client requirements. This not only helps us to keeping ourselves in line with the latest market trends and demand, but also enhances our market value. Our warehouse is built over a large area which helps us in safely storing our diverse range. In addition, our warehouse is regularly checked for moisture and dust. We export our products in European Countries, Middle East, South East Asia, Africa and USA, Malaysia, Austria, Singapore, Philipines, Indonesia, Italy, Germany, Hungary, Slovakia, Russia, UK, France, Poland, Turkey, Greece, Egypt, Israel, UAE, Dubai, Saudi Arabia, Kenya, Uganda, S. Korea, Ethiopia, Canada, Guatemala, Mexico, Srilanka, Bangladesh, Nepal, Myanmar, Thailand, Iran, Iraq, Israel, Jordan, Kuwait, Oman.